When it comes to hiring HVAC service in Portland, these services can include, but aren’t limited to, installing, maintaining, and repairing heating, ventilation, air conditioning, and refrigeration systems. Essentially, anything that helps to control the temperature and air quality in your home or business can be serviced by an HVAC technician. We want to ensure the best care of your property, so here are five questions we recommend you ask when hiring HVAC service in Portland. Whether it’s a small fix or a large fix, you want to hire someone you can trust. By asking the HVAC company if it’s licensed, bonded, and insured, you are guaranteeing that its technicians actually have the education, experience, and protection needed to correctly fix the problem. Additionally, you can make sure you are covered in case anything goes wrong or happens to the technician while on the job. In terms of insurance, ask if the company has both worker’s compensation and liability insurance. It’s always better to be safe rather than sorry. You also want to make sure that your HVAC company has the proper license to be doing work in Portland. The state of Oregon requires technicians and companies to have licenses before any work can be done. You don’t want to get yourself in trouble by hiring someone with the incorrect license. Also, ask for the company’s license number so you have that on file. Are you familiar with my specific unit? Not all HVAC units are the same. Because of this, you want to guarantee you’re hiring an HVAC company that’s familiar with the unit you own and that has technicians who have worked on that model before. This will help ensure you are getting the best quality care for your system and a complete fix, rather than a temporary solution. Additionally, make sure you specify whether your unit is an older or newer one. If you have a unit that is older, you will want a company with technicians who have experience with units as old as yours. By verifying that your HVAC technician is familiar with the type of unit in your home, you have a much better chance of a successful fix the first time. What is the total price quote? When it comes to choosing any sort of repairman, the final decision can sometimes come down to the price they are charging. Because of this, it’s important to ask from the get-go what the service will cost. Additionally, be sure to ask what work and equipment, if any, this price includes, as you don’t want any unexpected costs once they start working on your HVAC unit, especially not for something you thought was covered in the original quote. While asking about the pricing, be sure to also ask if the company offers a maintenance program. 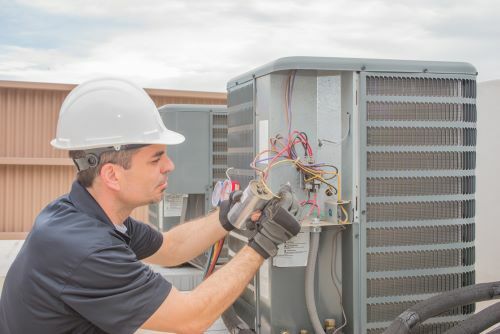 If the company has a service contract available, this can give you better peace of mind, as you’ll know that even after your HVAC technician leaves, your unit will be regularly serviced. This will reduce larger, more expensive problems that can occur later. If they don’t have a service contract available, or if this is something that is outside of your budget, ask what warranties the company has available. Ask for a detailed timeline of the job and a clear timeline for payments. Will you have to pay more if the project exceeds its original timeline? Will you be documenting the problems as you are repairing the issue? In case a different problem is found while the HVAC technician is working, you want to make sure there’s proof of it. Additionally, you want to ensure the problem was already there and didn’t happen as a result of this work. So it’s important you’re guaranteed the HVAC service you hire has a system to document everything the technicians are doing and all the observations they make prior to getting the work done. If an HVAC technician is willing to sit down with you and go over the documentation process, it shows you that the company is trustworthy and not trying to scam or nickel-and-dime you. Furthermore, if you have a warranty with the company, if an issue were to arise in the future, you have this documentation to show exactly what was originally done and when so they can better see if the issue stems from then. Are you willing to come to my home or business for an inspection? Before any sort of actual service is performed on your unit, you want to make sure the company you’re hiring is willing to first come to your home or business for an inspection. The company shouldn’t just give you a price quote over the phone or email without first seeing your unit and seeing firsthand the issue the technician will be working with. No two HVAC units are the same, so the unit should be looked at before any sort of estimate is given or work is done. The technician should also look at the layout of the ductwork, the number of registers in each room, the type of insulation used in your building, and so on. Then a diagnostic test should be run on the unit itself. As you can see, all these things need to be done in person and not over the phone. This may seem a little overwhelming, but it’s important to learn enough so you can make a good decision about the company you hire. At Entek, we have over seven decades of service and have lots of experience in the Portland area. If you are looking for HVAC service in Portland, we’ll come to your home or business for an inspection, give you a detailed timeline of expected work, and tell you how we’ll be documenting the process as we are repairing the issue. Contact us for an estimate today.